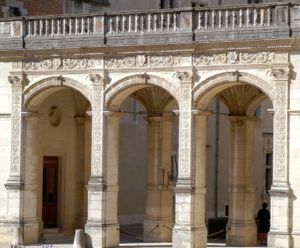 This historic building, the birthplace of Henri IV, is now a national museum. The Château de Pau, on the cliffs above the Gave de Pau River, has a long history. It is estimated that wooden walls were first built in the 11th century. Because of its strategic location, the Viscounts of Béarn (the name of the region) continued to build and fortify the château. Building continued into the 13th century. In the late 14th century Gaston Fébus, Viscount of Béarn, continued building it to it present form. It was later restored under Louis-Philippe. Some of the walls are more than a meter and a half thick (about five and half feet). In 1553 Henri de Navarre, later King Henri IV, was born at the Château. His cradle, made from a large turtle shell, is on display, along with other furnishings. 1572 saw Henri's marriage to Marguerite de Valois, sister of the French king Charles IX. Around the Château and gardens you'll see many "H" and "M" monograms. 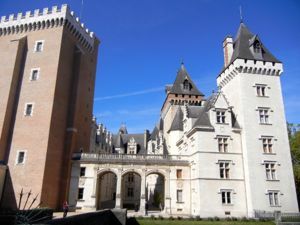 Today the Château is a museum, and visitors can see the private apartments, permanent collections, its large tapestry collection, and special exhibits. The Château also enjoys lovely views of the Pyrénées and has extensive grounds and gardens. Above, View of the Château de Pau. Below, Detail of the entryway, Château de Pau.